Sorry for the several days of silence. I've officially returned to school. The budget cutbacks caused a lot of reshuffling at our site and there was a lot to do in very little time. 1) I'm only teaching two classes now: World History and US History. No more math or science this year. 2) Fewer returning students than in previous years. I have about 65% new students which is a little unusual. These two changes have made for a challenging start to the year. I was told on Friday that I'd be teaching World History and was given a book at the end of the day. Students came yesterday and I had to be ready to start. It's hard to begin a year with no prep time, different books, and a new subject. 1) Teacher Editions for my textbooks! In the past I always had to solve problems on my own. This year, they gave us surplus replacement texts and they came with the Teacher Edition. Wahoo! And for the past 12 years I've been doing most of my illustrations freehand on a chalk or whiteboard. No more, I just received an overhead projector! No more drawing maps from memory with my back to the students - my poor geography students in past years had to suffer through my less than perfect renderings of our globe. Not today! 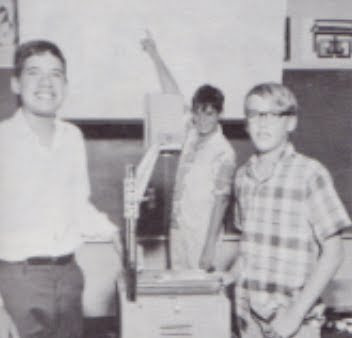 Now I'm not teaching math right now, but I cannot express to you how nice an overhead projector would have been at that time. It's really hard to keep quickly drawing coordinate planes on the board and then trying not to mess them up too much when illustrating graphs. Certainly busy, but I'd put this year in my top three "best starts to the school year!" I have to say that I am impressed by your cheerful attitude and can-do outlook. Question: If I wanted to send you an Email message, how would I go about it? Can't find your Email address on the Nonsense site. Anon: it depends on the textbook edition and the publisher if the teacher's edition is gratis. In the case of many new releases there is a cost for the teacher's materials. Nate: good on you for having such a positive attitude towards the shuffle. I can't even imagine how difficult it would be to teach a class with zero lead prep time.